Avoiding the prying eyes of the Ticket Checkers and Rail Police, nine-year-old Anwar, along with his younger brother Heron, sneak onto the night train everyday to come to Kamalapur Rail Station. The duo's long and laborious journey into the dark night starts from Kishoreganj where they used to lead a modest life with their mother until Anwar was diagnosed with tumours in the neck and armpit. Their father, who was the only bread earner, died two years ago. Now, with nowhere to and no one to help the family out, young Anwar picks through the city's garbage everyday to earn enough for a surgery. Still a toddler, Heron sits on the pavement of the station and waits while Anwar staggers through the city street, searching for empty mineral water bottles or anything sellable. Save for a plastic bagful of old clothes, the two brothers do not have anything to guard against the thugs and goons that roam around the capital. A month since their first journey, Anwar has not been able to save a hundred taka. Yet his eyes glint with hope and desperation. "I want to live," he says, "I don't want to die." Children like Anwar are the invisible majority in this city and they have their own stories to narrate. It is a story of shocking deprivation and abject poverty. It is a tale of a city, where flashy sport-cars speed through the streets where children like Anwar stare at the window under a hostile sun, waiting for an empty water bottle to be thrown at them. It is a story of a country where it is a crime to be born poor. A bunch of children gather together at Mohammedpur Beri Baadh. Some are flying kites, some on their way to school, others are running errands. Rubel, a 10-year-old, lives with his "ostad" from whom he learns to work on automobile engines. One of his brothers is a truck driver, the other works at a factory nearby. Rubel goes to school at Mary Stopes but is not interested in getting an education. "I just want to learn the trade," says Rubel. Yasmin's father is a CNG-run autorickshaw driver who makes some two to three hundred taka a day. Yasmin is a student of Class 8 in the nearby city corporation-run school. "I want to be a doctor when I grow up," says Yasmin brightly. Jhunu is a student of Class 1 at the same school. "My father is a ferry-wallah (vendor)," she says. "He sells paper." Jhunu's father makes around 50 to 60 taka a day. Jhunu is the only child of her parents. Asked what she wants to be, she doesn't hesitate for a second before saying, "A police inspector." Rubel, whose father abandoned the family a long time ago, manages to keep a cheerful face. He goes to school and his brother, a bus helper, earns just enough for them to survive. Robu, probably not more than six or seven years old, is dressed in nothing except a green lungi. "My father is a rong mistri (house painter)," he says. "My mother used to work as a maid but doesn't anymore." Robu's parents want to send him to school. But students have already been admitted into the current year, argues Robu, and he doesn't want to go. "I want to be a rong mistri like my father," he says. A school dropout, eight-year-old Miraj helps his father grease cars at a workshop in Mohammedpur. "The boy who used to run errands for my dad quit the job to go back to his village," Miraj says. Teachers at the UCEP school he had been going to, requested Shuruj Mia not to stop his son's studies. "But my father doesn't have any other way," Miraj says, "Ours is a very big family." Platform 8 at Kamalapur Station has been Shathi's (L) and Shefali's (R) home for years. The child wants to be a doctor, but does not know how this will be possible. He is not sure either when he will be able to go back to school. "My father's income alone is not enough for the family, we have to pay a house rent of Tk 400," he says. Every day the child, still a toddler, wakes up early in the morning and follows his father to the workshop near the Town Protection Dam in Mohammedpur. For him, the workload remains high as more and more dented reconditioned cars pour into the workshop. "I hardly get any time for play," he smiles. 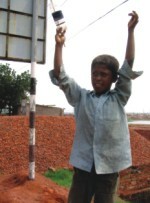 When he gets any, Miraj goes to the courtyard of an abandoned house nearby to play football with friends. "I love to keep the goal for my team," he says. Among about a hundred children that work as porters at the "Rail Station" for a meal is Shuhag. The 11-year-old fled home a year ago after his father died of liver cancer and mother Kohinoor "couldn't feed six mouths alone". The first day in Dhaka was harrowing for Shuhag, who had never stepped outside Comilla before. "There were already more than enough luggage careers in the station," he says, "some of them even beat me up". 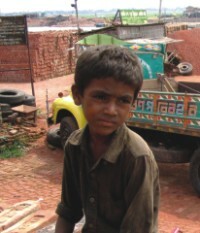 Eight-year-old Miraj is a school dropout and the son of a poor car workshop worker. He still dreams about being a doctor. Policemen, on the lookout for some quick bucks, swooped on the porters who worked without a permit. To become a "legal porter", apart from around Tk 10,000 that will go as bribes, Shuhag says he has to pay the government a lump sum amount of Tk 1,000. That, however, remains a far cry. "I only earn Tk 30 a day; sometimes even less than that," he says. Earning two meals a day remains a regular struggle for the young porter. A set meal of rice and egg curry, sold at Tk 8 at the roadside restaurant, is usually what Shuhag has for lunch. passenger over his shoulder. "I want to be a mechanic; one day I will be able to save money to go to a technical school," he says and walks into the crowd. A baby lies unattended at a platform at the "Rail Station". transport luggage. Siddique has no father, and his mother works in the fields back in Kurigram. One day, about a year ago, while playing back in his village, he mistakenly got on the train to Dhaka. He hasn't returned since, and his mother doesn't know where he is. "She must cry for me," reflects Siddique. 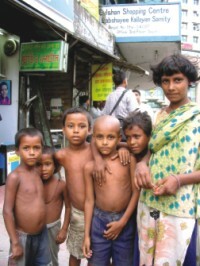 In Dhaka, the boy lives in "Mugda Club" where he is given three meals a day for Tk 25 and where he pays Tk 30 as "joma". At the station, he makes around Tk 50 a day. When he makes less than he has to give, he pays the "joma" and eats 5 taka's worth a meal that day. 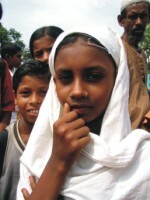 Siddique goes to the Aparajeyo Bangladesh school nearby but is not in any formal class, though he studies Class 1 texts. When he grows older, he wants to do a "bhalo chakri" (good job). "Maybe I can work at a house," he says, "do their bazaar and all. Or maybe I could run a shop." The dust all over Siddique's face does not hide his sweet smile, but his eyes seem to be groping for a stronghold as he tries to focus on his dreams. Kids of all sizes gather outside shopping centres to beg or take loads from shoppers. Shajib, a tiny boy in shorts who claims to be 11, takes his place beside Siddique, eager to tell his story. He has no father either, he says. His mother lives in Sylhet. A boy named Ronnie lured him to Dhaka around three months ago, promising him food, lodging and a job which would pay him Tk 300 a month. Shajib got on a train with Ronnie without even telling his mother that he was leaving. After reaching Kamalapur Station, Ronnie was nowhere to be found, and Shajib was on his own. "I didn't know anyone or anything in Dhaka," says the boy. He slept at the station, but there was an initial hassle with the people there, about whether he could live and work there. Finally a deal was reached by which he could take two "bojhas" (loads) of luggage a day which would pay him Tk 5 each and he could sleep at the station. But even here it's not safe, not even for the residents, for Shajib himself has been pick pocketed a number of times by other boys who also live here. One night he lost 50 taka to pickpockets. Shajib also goes to the Aparajeyo Bangladesh school and wants to be a "boro (big) officer" when he grows up. Jhunu, a student of Class 1, wants to be a police officer when she grows up. Twelve-year-old Halima lives with her parents in a slum near Kamalapur Station where she was born. Her father is a rickshaw-puller who makes 25 taka on some days and 100 taka on others. Halima's mother used to beg but she doesn't anymore. Halima has a sister and two brothers, but they're too young to go to school so she is the only one who goes. "My parents want me to work at an office," she says, "and to grow up to be a good person." The girl shies away at the mention of marriage but her smile still lights up. Does her family get by on what her father earns, Halima is asked. Yes, she says. "Sometimes we eat fish, at other times, alu bhorta (mashed potato). Sometimes we have to take "baki", though," she says. At Platform 8 sit two mothers with their babies. Shathi's son is 13 months old and Shefali's daughter, three years. Shathi has been living at the station for 10 years. She used to beg but stopped after getting married. Her husband used to work for WASA, where he used to make around 200 taka per day, but now he does construction work at the station and gets about 100 taka. Shathi wants to send son Rafiqul to a hostel when he is older and educate him there. "His dada (grandfather) is an officer at a bank," she says, "I will send Rafiqul to him." Shefali is from Jessore and has been living at the station for the past four years. She is pregnant with her second child. She wants her daughter to become a doctor. Her husband also does construction work at the station and makes between 100 and 150 taka a day. There is no place to cook at the station, so both women have to buy their meals, which usually range between rice, bread and bananas. It's more expensive to buy their food, they say, but they don't have a choice. Sometimes they spend over a hundred taka -- all that they make -- in a day. "On other days we can save a little," notes Shefali. high ambition, it is, indeed, difficult to remain a good human being. Shuhag (L) who sleeps on Platform 8, left home when his father died of cancer and his mother could no longer feed him. Suhail (R) ran away from home in the hope of being somebody. He ended up being a 'coolie' at Kamalapur Rail Station. they want from life. For them, it is more a question of getting by each day: Managing a couple of meagre meals for themselves and sometimes even their families; surviving the heat and braving the storms in polythene homes. Their dreams, like their lives, are limited to slums, pavements and railway platforms across the city. Even before reaching their teens, their eyes, instead of sparkling with hope, are blurred with uncertainty. With the helplessness and hopelessness of being trapped in a reality from which there is no way out.